I mentioned last time how Truckin' Man has this new off-roading hobby, and it is having it's benefits. One of those benefit's is the cooking I have been getting to do! I'm crazy right? The club has met at our place a couple times now, working on trail development. As long as they are here, working on our land, we have been providing lunch. They have insisted they don't need lunch, but I love the chance to cook for more than the two of us! 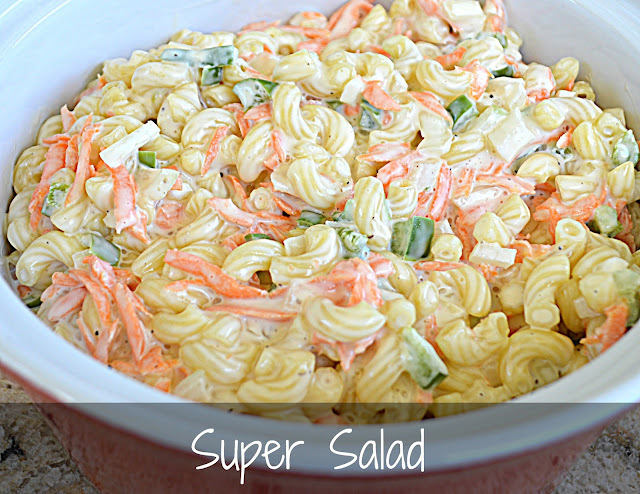 This Super Salad is a dish I knew I had to make for them, but getting the recipe from my mom took a while! Almost like she wanted to keep it a secret! I finally got it from her though, so no more secrets. Mom and Gram have been making this salad for years. 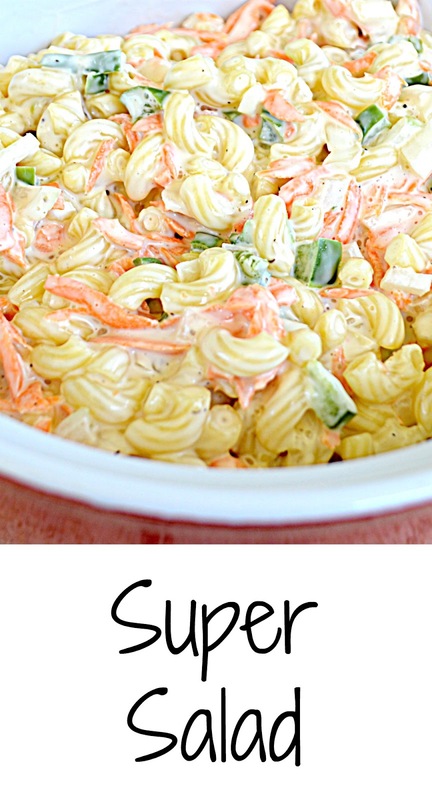 It's a crowd pleaser, and easy to make a large batch for big gatherings. Since our group was on the smaller side, I did make a small batch, but you can easily double this recipe to feed a bigger group. As a side note, I found a new pasta that I am in love with in making this recipe. I thought I picked up a box of regular elbow macaroni, but I actually picked up "Elbows". It's like an elbow, but with a twist. And just a little bit ridged... great for holding on this dressing! Cook macaroni according to package directions until al dente. Drain and set aside to cool. In large mixing bowl, combine sugar , vinegar, sweetened condensed milk, mayonnaise, salt and pepper. Taste for seasoning, add more salt or pepper if needed. Add vegetables, mixing until combined. Add cooled pasta, mix well. Let chill at least 4 hours, preferably overnight. Sweetened condensed milk in salad? Now that's new and very interesting! The salad does look super comforting and delicious, Kris. Kris, Oh I adore this pasta. 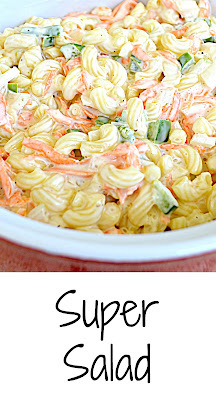 There is something about a twist to macaroni that looks fun! It is a good thing you got the secret recipe so you could share it with us. I was a little surprised to see sweetened condensed milk in the "secret sauce". I have to give this a try when I have a group to feed. Making this for 1 would be bad for the diet. How interesting! I was also surprised to see the sweetened condensed milk. Now I have to give it a try! Looks yummy. I bet you could add other things to the salad too. This salad looks like something my grandma meme would make with the condensed milk and all, looks fabulous Kris! WOW... interesting ingredient in this salad. It looks amazing. I am pinning and will try next week! Thank You! Yum! This looks perfect for a Summer picnic! Thanks for sharing - yum! I am glad I saw this, I was just trying to think of some sides to serve when grilling this weekend. Thanks so much for sharing with us at Celebrate365!